Commissioned by Karen Grimm of Black Horse Ranch and produced by Loza Electrica (Mexico). Eric Renaker. Jim was the son of John and Maxine, the Hagen Renaker founders. The Loza factory operated in Mexico from 1992-1998. Jose Garcia was the sculptor for most of Loza's figures. Loza also did contract work, making a few pieces for Karen Grimm of Black Horse Ranch. 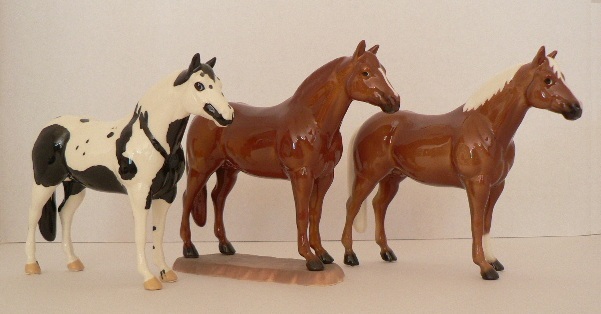 L-R: "Ozone" a black & white portrait horse, chestnut, and dark palomino. L-R: a cold painted bisque, bay, palomino, and gray. 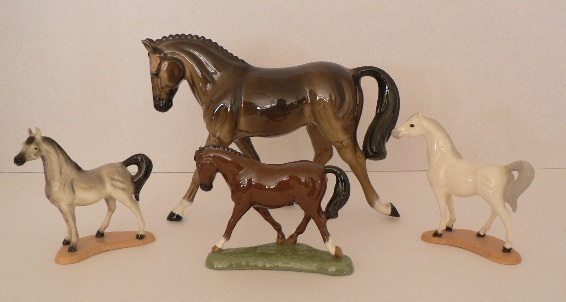 Front Row all sculpted by Jose Garcia: Mini Arabian in dark gray, mini dressage horse in bay, mini Arabian in light gray.